Psitek is a company that deeply understands the African market, I’m convinced that this is due to them having all of their work done on the continent. The last time I wrote about them was after I came across the nearly indestructible Streetwise mobile-accessible computer for children. This time it’s about Kazang, a prepaid terminal for merchants selling mobile phone services, such as prepaid airtime, paying of electricity bills or insurance. The service is a year and a half old now, and boasts nearly 5,000 vendors ranging from South Africa to Kenya to Zambia. The newest device, the Timpa, comes with all of the necessary requirements for the challenges that a merchant running a business in a rural (or urban) setting in Africa would need. 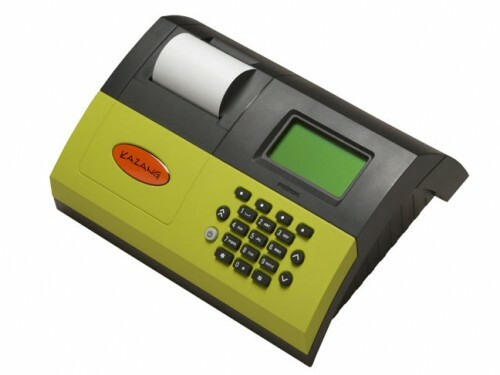 It has a built-in printer and rechargeable battery which makes it fully mobile, uses GPRS technology to communicate with the Content Ready (back-end) server (just plug in a data SIM card), and a large LCD with backlighting. They have also built in fail-safes for when the GPRS connection drops, or the electricity goes out, so that the merchant doesn’t get charged for a voucher that they didn’t receive. Psitek claims that clearing $1000/month is a reasonable to expect by vendors, which would bring home about $80/month of profit (8% margin). This alone makes it a fairly good proposition for a lot of merchants, meaning they can add a Kazang terminal to their shop as an added draw for more customers and it acts as to supplement their other revenue streams. Not written about much relative to their impact, Psitek is one of those tech firms offering devices that run behind the scenes of many businesses in the southern part of Africa. Adii Pienaar (aka Adii Rockstar) is the 7th in the African Digerati series of interviews. At only 24 he’s the youngest one on the list – he’s here because he represents the success that can be achieved as a young digital entrepreneur in Africa. Just under a year ago Woothemes splashed onto the stage as a new seller of WordPress (blogging tool) themes. Rumor has it that this might be the most monetarily successful startup in the new media scene coming out of South Africa… That’s in less than one year. Regardless of whether that is true or not, the fact is that Woothemes is one of the top WordPress theme sites in the world, and it’s grown out of Africa with a lot of work, an eye for design and passion. Woothemes just launched version 2 of itself, called WOO2. This interview is in response to that, and a chance to take a look at one of the visionaries behind it. After reading the interview, take a look at Adii’s blog. You’ll realize he’s light-hearted and doesn’t take himself to seriously, personality traits that I appreciate. When was the seed of Woothemes planted in your mind, and what was it’s genesis? What caused you to go from idea to actually building something, and how did you do that? I don’t really know… Magnus, Mark & I had been collaborating a bit more loosely and the business was growing quite steadily. So I think it was just a natural progression to formalize the collaborations into a business and brand it as WooThemes. Luckily for us, we had a good following at that stage and the foundations were good all round to launch WooThemes. Would I be egotistical to say that I inspire myself? 🙂 Honestly though, I’m inspired by a bunch of different things on a daily basis; and those things are random at best. The “being inspired” bit, along with willingness to act on said inspiration is a result of me absolutely loving a challenge and thus being completely driven to pursue those challenges. Online, I’ve got a lot of respect for entrepreneurs like Ryan Carson & Collis Ta’eed, who are at the top end of this new wave of entrepreneurs. Offline I’ve always appreciated Richard Branson’s way of going about business and marketing his ideas. And then closer to home… I’ve learned a helluva lot from both my business partners – Magnus & Mark – whilst I’d be lying if I said that my dad didn’t influence my business mind a lot – especially when I was younger. Woo2 is a redesign of the Woothemes site and the community platform behind it. What are the big changes, and why do they matter? Facing outwards, I think WOO2 signals our intent with regards to further growth and also improving the current experiences on WooThemes. On a business level, I think WOO2 is more professional and we put a lot more strategic thinking into it. So again, it’s some kind of natural progression of how we’ve grown. WOO2 is the next step and the next part of the journey ahead. Woothemes is expanding to other platforms beyond WordPress (Drupal, Expression Engine, etc.). What is your strategy here, and when will we start seeing these themes for different platforms? The strategy is basically one that aims to diversify our offerings (and also our risk of having all our eggs in one basket), along with the growth aspects (new products = new markets = new users). And whilst I’m reluctant to commit to any schedule in this regard, we will start rolling out the Drupal themes in the next 2 / 3 weeks, and we’ve already started work on the EE & Magento stuff. There’s always been the debate amongst the WordPress intelligensia about some theme providers not honoring the WordPress GPL licensing. iThemes, Brian Gardner and others have changed stances. I noticed you have as well. Is this where you wanted to go, or was it something that the greater community forced upon you? How will this help your business? I can categorically say that this wasn’t something we did because we felt forced to do so. Way back in August 2008, I told Matt Mullenweg (at WordCamp SA) that going GPL was on the horizon for us and we’d do so when we felt comfortable doing so. How big is Woothemes and how active is your community? Can you give any numbers? This is tempting, but I’d rather not share these numbers… Maybe in the next couple of months, we’ll adopt a more open approach and share some of these numbers, but we’re not into boasting about supposed success. You’ve successfully created a web business out of South Africa that has impacted people around the world. You’re tapped into the web in a way that few others are. What’s next? What does the big picture look like from a the Rockstar perspective? I’m taking over the world, one WordPress installation at a time. LOL no… I’m very content with what I’m doing at the moment and very happy with the space & freedom that WooThemes has afforded me. I’m still young (24), so at this stage I’d like to think that I’m trying to revolutionize my own life, in terms of how I work and how I act outside of business hours. Beyond further growing WooThemes, that’s probably my main focus, because I want to do this now and not when I turn 30 / 40 and realize that I’ve work my life away. Finally, what are your thoughts on the impact of blogging in your own continent: Africa? I’m ashamed to admit this, but Africa is generally a deep dark place for me (which I’m planning on rectifying with a proper journey into Africa – for holiday – later this year). So I’ve honestly not met many Africans who are bloggers. BUT… In theory I think blogging gives everyone a voice; a voice they didn’t have before. And that’s true freedom & power for me, which we’ll ultimately see itself manifest when Africa becomes one of the strongest nations / economies in the world. There have been a couple new entrants into the mobile and web space in Africa that I haven’t had a chance to review adequately. One of them is The Grid, by Vodacom. Also in this post is a new documentary on mobile phone use in Africa. The Grid launched into Tanzania in April. According to Vincent Maher, who heads up the project, there has been very favorable growth rates of the service. Besides being a well designed and well integrated mobile/web social network, what I’m really looking forward to hearing about is The Grid’s location-based advertising unfold. For launch, they have partnered with Nandos, Sportscene, Jay Jays and Synergy pharmacies to deliver advertising within radii ranging from 0 – 10km from a users physical location. Vodacom has the muscle to pull this type of thing off, and the connections to create the advertiser relationships. The Grid is really a direct competitor to Google Latitude (I’ve written about this here), something I’m really excited to see coming out of Africa. Before 2001, the year the first cell tower was erected in Zanzibar, people had very limited means of communicating with each other from a distance. Today, the situation is completely the opposite. Cell towers from main operators cover the whole island and people communicate all the time with their mobile phones. It is difficult to imagine how it once was before. There are plenty of aspects about the ongoing changes that could be covered in a documentary, but the purpose of this fillm is not to elaborate and draw conclusions. The purpose is to catch the vibe, the know, show what’s going on right now. A snapshot of the Zanzibarian zeitgeist. 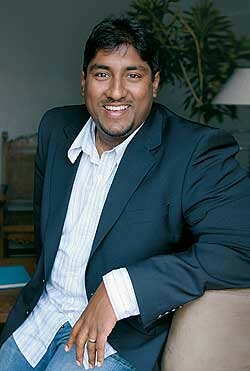 Vinny Lingham has had two big hits in the last couple weeks. Just a week ago, in the midst of this down economy where web apps are dying every day, he managed to pull out a second round of funding for Synthasite worth $20 million. That’s a lot of money in a good economy, in a down one it’s huge. Today, he was announced as one of the World Economic Forum – Young Global Leaders for this year. The others joining him from the Bay Area include the likes of Zuckerberg (Facebook). There have been others from Africa (full list), and it’s quite a group to be associated with. Vinny is proving to be a great example of the type of tech entrepreneur that Africa creates. My hope is that he continues to be a resounding success in the global market, thereby bringing more investors and businesses hunting for real investment opportunities, not just looking to give handouts. Things are definitely heating up in the African tech sphere according to my calendar of African tech events (Events RSS feed) for the remainder of the year. From Madagascar to Mauritius there are unconferences, conferences and adhoc meetups happening at a rate I haven’t seen before. The African tech scene is definitely getting bigger and noisier. 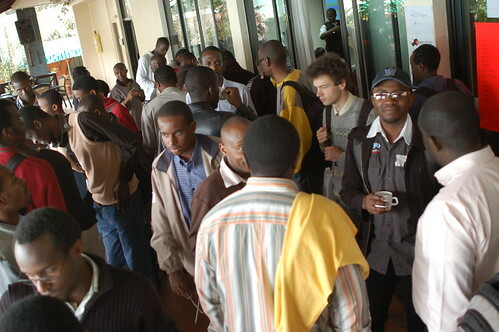 * I will stream in live to Barcamp Africa with the South Africans, but it’s also open in Kenya and Ghana. On top of these scheduled conferences and unconferences, there are many meetups happening all over the place – from the monthly 27Dinner in cities around South Africa to the bi-monthly Skunkworks meetings in Kenya. Africa’s a happening place – just watch!